Before the Civil War bloodied Virginia soil and finally came to an end at Appomattox, other significant events in American history took place on a peninsula jutting into the Chesapeake Bay. 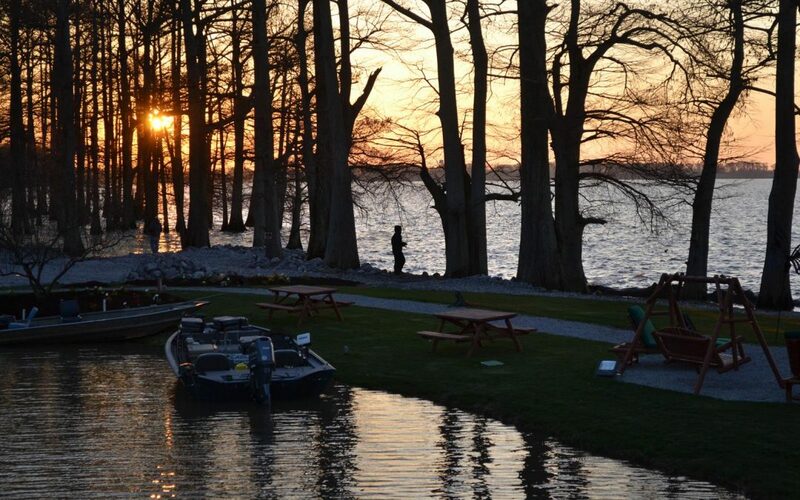 Today a number of group-friendly attractions, conveniently linked by the 23-mile Colonial Parkway, are found in communities that helped shape our country. 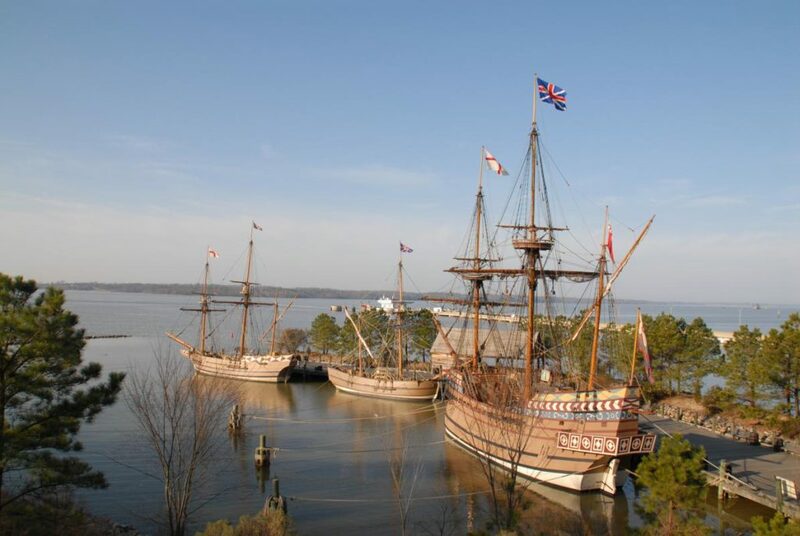 Visitors to Jamestown Settlement, one of America’s best open-air museums, can board replicas of the three ships that carried English settlers to the New World in 1607. Recalling the first English colony in the New World, Jamestown Settlement visitors embark on a journey that introduces them to the diverse cultures, events and environment of 17th century Virginia. This living-history museum is located near the original site settled by the English in 1607. The story is told through films, a timeline gallery and historical interpretation in re-created settings. A visit should begin with the docudrama film 1607: A Nation Takes Root. The film provides a look at Virginia’s first two decades, including the evolution of the Virginia Company, sponsors of the Jamestown Colony. It examines the relationship between the settlers and Powhatan Indians along with the arrival of the first Africans in 1619. Spanning the length of the museum’s exhibition galleries is a chronological journey from 1600 to 1699, the year Virginia’s capital was moved from Jamestown to Williamsburg. The galleries are split into three sections. Objects from 17th century Europe, Africa and Virginia are on display along with three-dimensional structures and small theaters. The first gallery looks at the period before the arrival of English colonists, with full-scale dioramas, exhibits and objects representing each of the parent cultures: Virginia Indian, African and European. The second gallery explores the relationship between the English colonists and the Powhatan Indians. The need for labor in the tobacco fields and the arrival of the first Africans is also explored. Political, social and economic development is introduced in the third gallery. After touring the museum and its indoor exhibits, visitors venture to the archaeologically accurate Powhatan Indian Village. Historical interpreters share stories and demonstrate how the Powhatans farmed and prepared food, processed animal hides, and made tools and pottery. From the Powhatan village the path leads to re-creations of the Susan Constant, Godspeed and Discovery. 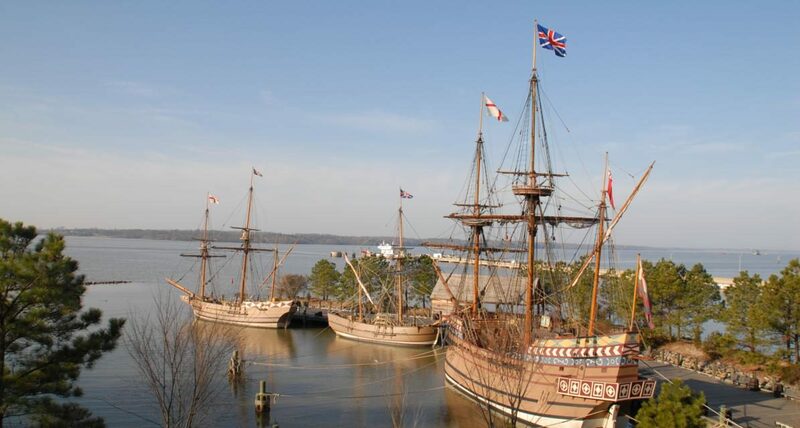 These three ships transported the English colonists to Virginia in 1607. Historical interpreters invite visitors to board and learn about the four-and-a-half month voyage from England. At re-created James Fort, the colony’s military and commercial culture is on display. Interpreters provide visitors with a glimpse into 17th century life from forging metal and woodworking to food preparation and sewing. Jamestown Settlement is ideal for groups with even a minimal amount of interest in history. Guided tours and dining and shopping options are available. For information, call 888-868-7593 or 757-253-4939, email group.reservations@jyf.virginia.com or visit online at historyisfun.org. It was on Jamestown Island that Virginia Company settlers landed May 14, 1607. Just days after landing they were attacked by Powhatan Indians. Starvation, disease and occasional attacks from the Powhatans took a toll on the first successful English colony in North America. Today, the Historic Jamestowne Visitor Center features a theater-in-the-round orientation film highlighting the history from prehistoric times to the present. Nearby the Archaearium presents more than 4,000 artifacts from the ongoing archaeological work being done by the National Park Service. Members of the Jamestowne Rediscovery team regularly provide archaeological tours; a weekly schedule is available online. Specialty tours such as “In the Trenches” and “Curator’s Artifact” are available for smaller groups. “Archaeology in Action” and “Finds and Forensics” educational tours are perfect for school groups. For details, call 757-856-1250 or visit historicjamestowne.org. It’s the dawn of America and you’ve stepped into a 300 acre-town. There are some revolutionary thoughts surfacing in this 18th century community. Meet the men and women, the artisans and shopkeepers, the politicians and servants and hear their stories. Dozens of re-created and restored buildings line three main thoroughfares and side streets. Ladies, this one’s for you; gentlemen welcome, too. The founding mothers played an important role in our nation’s history. The women’s perspective begins with the “Talk of the Town” women’s tour. Next, learn the rules of high society at The Polite Academy. Tour the Governor’s Palace and meet the charming Lady Dunmore. Businesswomen contributed to the economy with numerous trades. Enjoy tea at Christina Campbell’s Tavern with Mrs. Campbell. There will be time to visit with Mrs. Washington as she shares the duties of the president’s wife. During the 18th century, half of Williamsburg’s population was black, and slavery was an important part of Virginia society. You’ll visit the Peyton Randolph House and discover the differences among a prominent family and enslaved members of the household. African- American religion heritage is explored in the Taliaferro-Cole Stable, across the street from the original site where African-American Baptists worshiped. Witness the daily working life at the Great Hopes Plantation, where the importance of story and song was presented. in Virginia, both springtime events. Those interested in art and antiques will want to visit the DeWitt Wallace Decorative Arts Museum and Abby Aldrich Rockefeller Folk Art Museum. 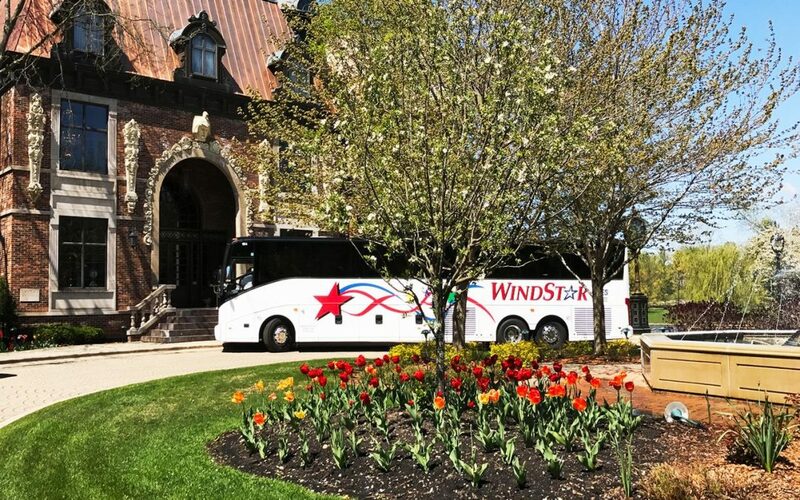 Stops at the Governor’s Palace and Bassett Hall follow the museums. The demonstration kitchens at the Governor’s Palace, R. Charlton’s Coffee House, Raleigh Tavern and Chowning’s Tavern will satisfy your interests in cuisine and spirits. At the Taste Studio you’ll do a “Chef’s Garden Tour and Tasting” followed by American Heritage classics presented in the full-service demonstration kitchen. Colonial Williamsburg group tour representatives can help you with a customized tour. 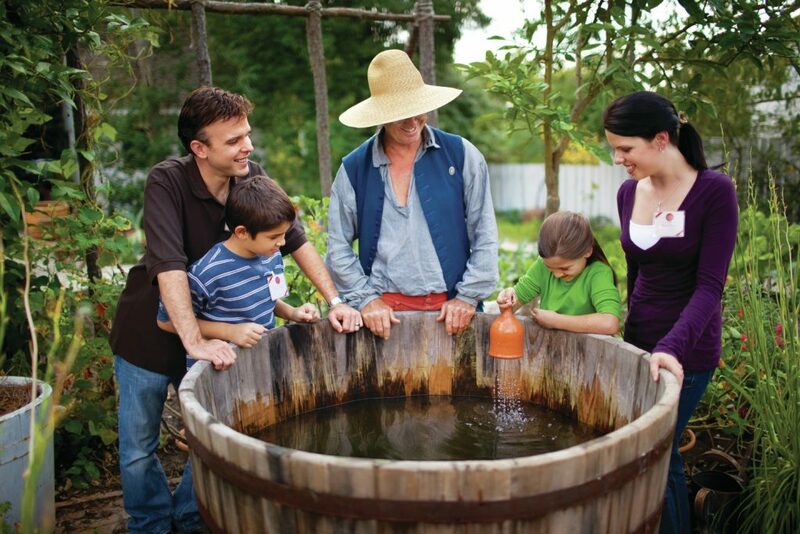 Call 800-228-8878, email groups@cwf.org, or visit colonialwilliamsburg.com/grouptours. Hear the nation’s story from the colonial period to the Constitution and beyond, including the surrender of English forces signaling the end of the American War of Independence. 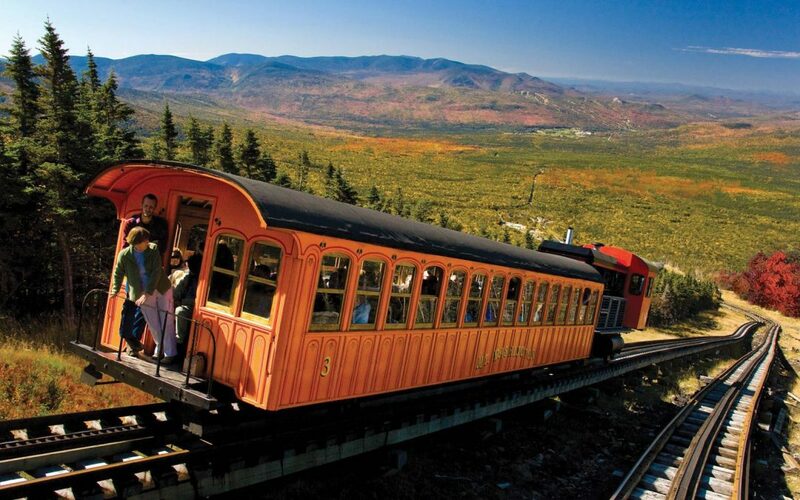 Exciting galleries, interactive and hands-on exhibits, and dynamic films and outdoor living history areas enthrall groups. and seawater accompanied by rumbling seats, wind and smoke. The five permanent exhibition galleries follow a 1750s-1790s timeline with period artifacts and numerous hands-on opportunities helping visitors feel a real connection with the period. The British Empire and America is the first gallery. The period inspects the geography, commerce and culture of the original colonies and what prompted England to levy taxes. Rising tensions are explored in the second gallery, The Changing Relationship – Britain and North America. From the Stamp Act to the First Continental Congress, the rift continued to grow. Revolution is the third gallery and presents the war from early confrontations in Concord and Lexington to victory at Yorktown. American victories in 1775 and 1777 led to a formal alliance with France. Conflicts in the South are shared and the wartime home front is portrayed with the stories of patriots, Loyalists, women, and enslaved and free African-Americans. The fourth gallery is The New Nation. From the 1783 Treaty of Paris recognizing the United States to the recognition of the need for a strong government, the challenges facing the new nation are addressed. The American People, the final museum gallery, examines the growing identity of the new nation. Immigration, demographic, political and social changes are explored. Providing a powerful conclusion, this gallery is a look at how the birth of American democracy has influenced the world. After departing the museum, groups experience a re-created Continental Army encampment. Historical interpreters share the daily life of the soldiers. Visitors are trained in military drills and the basics of espionage. Nearby a Revolution-era farm invites visitors into a dwelling, tobacco barn and kitchen. You can help with tending the garden and processing plant fiber for cloth. The American Revolution Museum at Yorktown features guided tours with dining and shopping options available. For information, call 888-868-7593 or 757-253-4939, email group.reservations@jyf.virginia.gov or visit online at historyisfun.org. 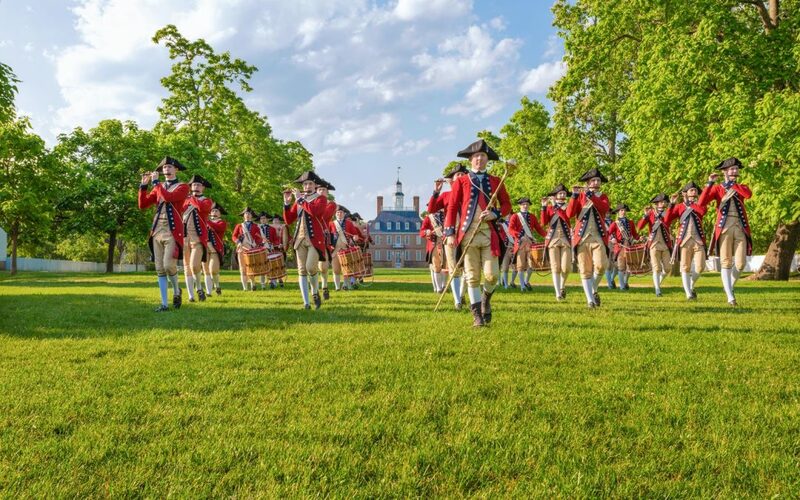 For information and itinerary assistance in the Greater Williamsburg Area, contact Vivian Bunting, tourism sales manager, at 800-368-6511 or bunting@visitwilliamsburg.com. Begin planning online at visitwilliamsburg.com/topic/group-tours.